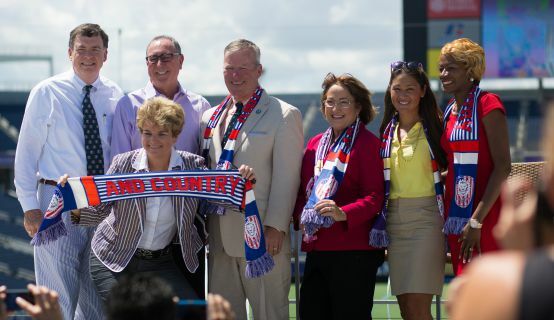 Orange County Mayor Teresa Jacobs joined community leaders on Monday to announce the highly anticipated U.S. Women’s National Team (USWNT) Victory tour match against Brazil, which the U.S. defeated in the recent World Cup competition. The historic soccer rivals are set to face off on Oct. 25 at 3 p.m. at the Orlando Citrus Bowl. The USWNT will return to the Orlando Citrus Bowl for the first time since the U.S. defeated Brazil in November 2013, when more than 20,000 fans attended. The match was the highest attended match for the USWNT that year. Orange County has witnessed a tremendous amount of support for soccer, especially since the Orlando City Soccer Club made their Major League Soccer debut. The U.S. team has a long history in Orlando, which was the training base for the U.S. team for the 1995 and 1999 Women’s World Cups and the 1996 Olympics. The USA played two matches at the Citrus Bowl during the 1996 Olympics. In late June, an international friendly match between Mexico and Costa Rica took place at the Orlando Citrus Bowl – marking the Mexican team’s first visit to Orlando since the 1994 World Cup. More than 54,000 supporters attended that event. Tickets for the October 25 match against Brazil will go on sale on Friday, August 21 at 10 a.m. A special pre-sale offer will be provided to Orlando City Season Ticket Members. A collection of photos from the USWNT announcement may be found on Flickr for use by the media.